Boat Safe Survey Ltd’s examiner - Tony Pope - is a qualified Boat Safety Examiner who trained for the BSS at Evesham College in Worcestershire during the autumn of 2004. Building on a long career of engineering, inspection and maintenance in a wide range of disciplines and techniques, he has attained both CCN1 (natural gas) & CCLP1 (LPG) accreditation to satisfy the current requirements for Boat Safety Examiners to be qualified to examine gas systems on all types of marine craft. Tony is a partner in the Nationwide Alliance of Boat Surveyors & Examiners LLP (NABSE) and holds qualifications from the International Institute of Marine Surveyors in Yacht and Small Craft Surveying. A qualified RYA Yachtmaster and Coastal Skipper, Tony currently owns the Viking 24 motor cruiser ‘Papa Alveus’ based at Lock Marina in Upware, Cambridgeshire. 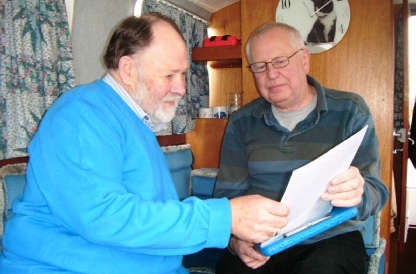 Did you know that Boat Safe Surveys Ltd can offer a full range of professional surveys for boat owners? Whether you are thinking of buying a boat or are in need of an out-of-water survey to satisfy your insurance underwriter, the condition surveys represent excellent value for money and the ‘Plain English’ reports are well presented and are easy to understand. The company holds full surveyor’s indemnity insurance and has public liability cover up to £2m. Survey prices start at £295 - and as the company is not VAT registered, there is no VAT to add to the price! Follow the link here to the survey website. Hugh Turner, Moorings & Fisheries Manager, Essex Waterways Limited.